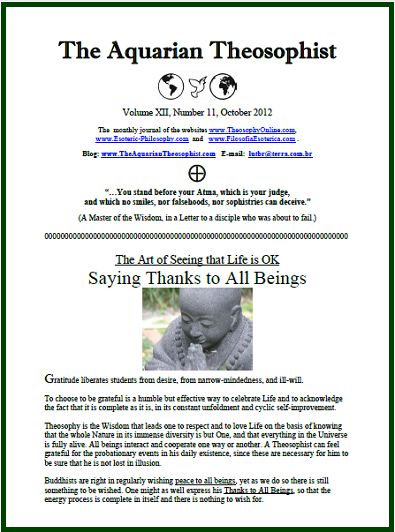 On page 1 of the present edition, the article “Saying Thanks to All Beings” discusses whether there is a real need to desire anything. Is not Life complete in itself already? Pages 2 and 3 examine the self-criticism made by H.P. Blavatsky in 1889-1890, for having miscalculated in her writings the ethical weaknesses of the world at large. There is a practical lesson for us in the episode. The Aquarian goes on with a letter from a Master of the Wisdom to a disciple who was about to fail. The document shows how frank can a real sage be. On page 5, we have the analysis of a photo taken in India in the 1880s, which shows several leading pioneers of the theosophical movement. On page 6, readers can see the article by H. P. Blavatsky entitled “The Mind in Nature”. On pp. 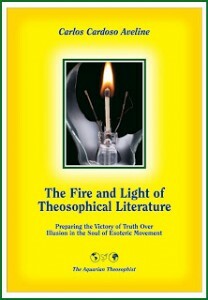 10-11, the note entitled “The Beauty of Abstract Truth” investigates a common ground between Theosophy and the 18th century philosophy of Francis Hutcheson. Closing the edition, Robert Crosbie writes that “there is a chance for us”, which depends on us making certain decisions in life.